June 5, 1958, Greencastle, Ind. 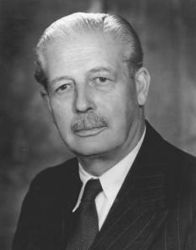 - "A highly-important policy talk may be in the offing when British Prime Minister Harold Macmillan appears at DePauw University's 119th annual commencement exercises Sunday," reports today's Daily Banner of Greencastle. "Although Macmillan is scheduled to confer with President Eisenhower in Washington during his official visit to the United States he will make his major public address here. The subject of the speech, which is being telecast directly from Blackstock Stadium by the National Broadcasting Company between 5:30 and 6 p.m. CDT, will be 'Interdependence.'" The newspaper reports that DePauw officials have made arrangement to accomodate the crowd of more than 6,500 expected for the event. "The graduating class itself is one of DePauw's largest, with more than 410 seniors expected to receive academic degrees during the two-hour ceremony." It adds, "A special section has been set aside at the stadium for representatives of the press, radio, and television, and indications are that more than 100 newsmen will cover the event. Also planned is a 30-minute press conference at Weir Cook Airport in UIndianapolis, where Macmillan will arrive at 1 p.m. Sunday from Washington in a BOAC four-engine Brittania aircraft." The prime minister's traveling party will include Sir Harold Caccia, British ambassador to the United States, and Lord Nicholas Lennox, second secretary at the Washington embassy. They'll be greeted upon arrival in Indianapolis by Indiana Governor Harold Handley and newspaper publisher Eugene C. Pulliam '10, among others. A police-escorted motorcade will bring Macmillan to Greencastle via U.S. 40 and 240. He will arrive at the home of DePauw President Russell J. Humbert at 2:30, remain there until 3:45, then travel to the commencement site along Seminary, Hanna and Locust Streets. 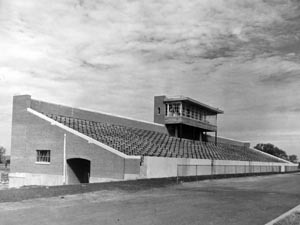 At 5:30, Humbert will introduce Macmillan to the capacity crowd in Blackstock Stadium and the millions watching on television. The prime minister will receive an honorary Doctor of Laws degree and present his address, which will last approximately 27 minutes. Shortly after 6 p.m., Macmillan will say goodbye to his hosts at Humbert's home and return to Indianapolis, where he will spend the night at the Marrott Hotel. In the event of rain, Sunday's event will be moved into Bowman Gymnasium, with closed-circuit television carrying the entire program to an overflow crowd in the local high school gymnasium. NBC-TV's mobile unit will arrive in Greencastle from Chicago at 4 a.m. Sunday to make final preparations for the coast-to-coast telecast, although reflectors already have been installed at the stadium and gymnasium. 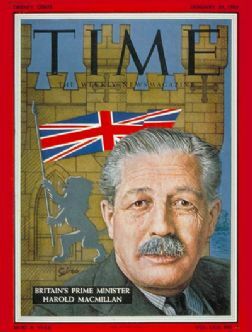 Read the original story announcing Harold Macmillan's visit by clicking here.